Brakes returned from the long trip to Norfolk with a point and a clean sheet which, after the previous Saturday’s result, represented some kind of a return to normality, writes Paul Edwards. However, they were largely indebted to a solid defensive performance, led by a man-of-the-match display from Jamie Hood on his return to league action. A let-off for Leamington as Courtney Baker-Richardson appears to handle in the visitors' penalty area. What was more concerning was the lack of attacking thrust on what was, admittedly, a very rutted pitch, with no shots on goal over the course of the 90 minutes. The home support, who have seen their side concede six against Weymouth before smashing five past Slough in the first half on Tuesday evening, must have been even more frustrated that despite enjoying the vast majority of possession, they only managed a couple of serious shots on goal themselves. Ahmed Obeng’s pace almost got him in behind the hosts’ defence a couple of times early on. But with the ball jumping up all over the place on the bumpy surface this was never going to be the kind of game he would thrive in, much like Callum Powell on the opposite wing, who endured a frustrating afternoon on his debut after joining on loan from Wrexham. That the first shot at goal arrived with just over 20 minutes played gives a clear indication of the type of game it was, Ryan Hawkins lashing in a low drive from out on the right that was comfortably held by Tony Breeden. Linnets skipper Sam Gaughran’s header looked to be heading towards goal until it hit the back of a Leamington defender and was cleared away. The visitors rarely got out of their own half in the opening 25 minutes and Breeden was caught out of his goal on the left touchline after racing across to twice try and clear the ball, Michael Clunan attempting to embarrass him but falling some way short as the ball dropped well wide of the net. A 28th-minute free-kick into the King’s Lynn penalty area represented the first real opportunity to put some pressure on the hosts but the ball was floated straight into the arms of keeper Alex Street. Sadly, this was as close as Leamington got to their opponents’ goal all afternoon. Hood was a colossus at the back for Leamington, highlighting just how much he has been missed in recent weeks as he blocked an effort from Hawkins and was then in the right place to get in the way of another shot as King’s Lynn threatened to bulldoze their way through. Gary Setchell’s men were well on top at this stage and Breeden had to dive full length to push away a piledriver from Sam Warburton, who was afforded far too much time on the left to advance into a shooting position. There were plenty more nervous moments as King’s Lynn continued to pile on the pressure in search of that all-important goal, but they were thwarted at every turn as the Brakes defence displayed the kind of resilience that had seen them concede just 17 goals in their 29 league games prior to the Slough capitulation. Richard Taundry curled a cross-come-shot well wide towards the end, though it looked very much like he was attempting to find Obeng at the far post. 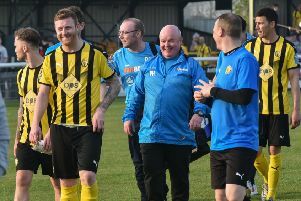 The hosts were unable to turn their territorial advantage into goals, however, and Leamington held out to claim a point. King’s Lynn: Alex Street, Jacek Zielonka (Toby Hilliard, 82), Ryan Fryatt, Sam Gaughran, Tom Ward, Daniel Quigley (Lee Smith, 71), Michael Clunan, Shaun McWilliams, Ryan Hawkins, Kurtis Revan (Lee Stevenson, 57), Sam Warburton. Subs not used: Jordan Yong, Dylan Edge. Brakes: Tony Breeden, Richard Taundry, Connor Gudger, Joe Magunda, Jamie Hood, James Mace, Callum Powell (Richard Gregory, 68), Darren Pond, Courtney Baker-Richardson, Callum Gittings, Ahmed Obeng (Rob Thompson-Brown, 82), Subs not used: Jordan Goddard, Ben George, Martyn Naylor.